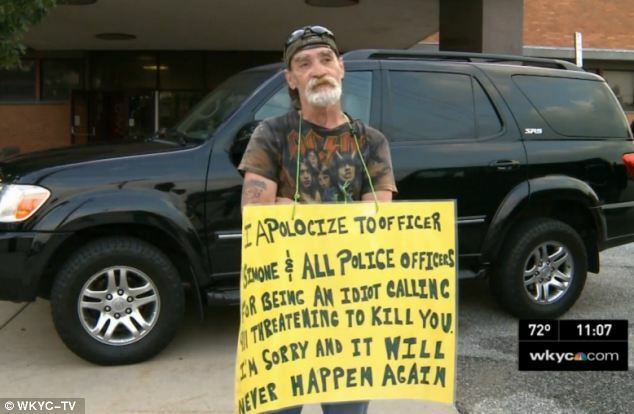 An Ohio judge has forced Richard Dameron to stand outside a police station wearing a sign referring to himself as an “idiot” for calling 911 and threatening to kill officers. Richard Dameron, 58, will be wearing the large yellow sign with black lettering for three hours every day this week as he stands outside the Second District police station in Cleveland, Ohio. The punishment was handed out by Cleveland Municipal Court Judge Pinkey Carr. The apology was directed at former “super cop” Jim Simone, a retired officer who was shot twice in his career, including once to the head. Police said Richard Dameron threatened to kill his son’s girlfriend and Officer Jim Simone in February. Speaking outside the police station with the sign around his neck, Richard Dameron expressed his remorse. “I stand up and be a man and do what I’ve gotta do and get it over with,” he told WEWS. The judge handed out a similar punishment to a woman who drove around a schoolbus last year. Cleveland Metropolitan School District bus driver Uriah Herron had captured video of Shena Hardin driving on the sidewalk so that she wouldn’t have to stop to wait for the children to get on and off the bus. Shena Hardin had pleaded not guilty to the charges at a court hearing but later changed her plea.